If you have never hired professional musicians for a special event, you may be at a loss as to what to do. This set of F.A.Q. 's is an attempt to cover many of the common questions that you may have. In addition, please feel free to inquire about anything else that may be unique to your particular event. The easiest way for you to get started is to complete and submit the CONTACT US form, where you can include special Comments/Questions. If you prefer, send an e-mail message (sdberger@charter.net) directly to me, or call me at 636-230-8044 to initiate a more detailed conversation. With over 20 years of experience, I will be happy to help you orchestrate the perfect musical package for whatever you are planning. What combination of instruments is included in each of THE QUARTETTE ACCORD ensembles? THE ACCORD DUO will usually be a violin/cello combination. If you intend to choose standard wedding repertoire or are looking for classical background entertainment, either a violin duo or a violin/viola duo is an option that you may wish to consider. THE ACCORD TRIO will consist of a violin/viola/cello or a violin/violin/cello combination. THE QUARTETTE ACCORD will give you the standard string quartet grouping - two violins/viola/cello. How do I choose the right ensemble size (i.e., duo, trio, quartet)? The string duo is best suited for relatively small gatherings (well under 100 guests) or for a church setting where you have other musicians (singer, organist, etc.) providing a major portion of your ceremony music. Otherwise, depending on your budget and personal preference, you'll find either the trio or full string quartet equally satisfactory in providing you a beautiful chamber ensemble sound. How do I hire one of THE QUARTETTE ACCORD string ensembles? In order to reserve the services of one of THE QUARTETTE ACCORD ensembles, you will need to sign a contract and submit a non-refundable deposit. How much will it cost for me to hire one of THE QUARTETTE ACCORD string ensembles? The cost of hiring one of THE QUARTETTE ACCORD string ensembles will vary, depending on the size of the ensemble that you choose and on the amount of time that you need. Also, the location of your venue may necessitate an additional travel charge. Finally, you can expect some extra cost if you choose a song/selection that is not currently in THE QUARTETTE ACCORD repertoire. In general, however, basic fees for the DUO, TRIO, or QUARTET ensembles give you anywhere from a one to a two hour block, and are therefore adequate for many types of engagements (wedding ceremony, ceremony and cocktails, cocktails and dinner, open house, etc.). These basic fees range from about $300 to $550. I only need music for my wedding ceremony, and am sure that it will not last more than an hour. Do you offer a reduced one-hour rate? NO! After many years of experience in this business, I am convinced that you do need to allow for some "wiggle" time, regardless of the type of special event you are planning. In particular, wedding ceremonies rarely start on time. Traffic conditions alone may impede timely arrival of guests, for example, and you should not feel rushed into getting things underway just to meet the musicians' deadline. Likewise, by extending the boundaries of the performance time block, I can offer you a custom package of favorites for both before and after your ceremony, may be able to provide post-ceremony photo shoot entertainment, and will have some flexibility with respect to rehearsing with a singer for a special ceremony song, etc. Even if you won't need a full two hour block, inclusion of a "buffer" zone for your musicians will definitely help reduce the overall stress for your day. YES! However, some conditions impede our playing ability to such a degree or are so damaging to our instruments that special accommodations must be provided. We cannot perform in the rain, in direct glaring sunlight, in overpowering wind, or when the temperature is much below 65 degrees F. or above 90 degrees F. In these situations, there must be an alternate rain or inclement weather location available, or provisions should be made for an onsite shaded/covered/wind-free performance area. Will you charge me a travel fee to get to my venue? As long as your special event will take place somewhere in the St. Louis metropolitan area or in the St. Charles MO area, there will be no additional travel fee. For points beyond, there will usually be at least a nominal travel charge (sometimes as little as $10 per musician), depending on the total distance involved and time required to reach your destination. If you send me the exact address for your chosen venue, I will be able to determine the travel charge, if any, that will apply. In general, we will rarely accept a booking that requires more than 75 - 90 minutes of travel one way. Will you work with other musicians? We are more than willing to work with singers, cantors, pianists, organists, trumpet players, and the like. If you need assistance finding other musicians, we will also be happy to refer you to professionals with whom we have worked in the past. We do accompany singers or cantors, and we can help you choose music that will be most suitable for this. If you are interested in using a song that is not in our repertoire or that is not currently arranged as a vocal accompaniment, we will also discuss the feasibility and/or cost of making this possible. Is a separate time scheduled to rehearse with a singer or other instrumentalist? Will this require an additional fee? Since my basic fee gives you up to a full two hour block, we can usually rehearse with a singer or instrumentalist on your event day, immediately before we are scheduled to perform. If we are accompanying a cantor for a full Catholic mass, we can still often cover what is needed by scheduling a rehearsal 45 minutes prior to the ceremony start time (1:15 - 3:15 block for a 2 p.m. ceremony, for example). In this case, you will, however, have to keep the total number of selections to be accompanied at a reasonable level. If there is a really significant amount of music to coordinate with other musicians, you will probably need to consider having us arrive even earlier for a nominal additional rehearsal fee. How do I choose music for my wedding ceremony or special event and how far in advance should I do this? A free in-home consultation is offered to help you select the exact music that you want. If you have hired one of THE QUARTETTE ACCORD ensembles for something other than a wedding ceremony, you may not feel a need to meet with me personally, although you are more than welcome to do so. Instead, you may prefer to simply browse through the Repertoire lists that are posted online, and then send me some indication of the style or mix that is best suited to your special event (dinner reception, party, open house, etc.). If you need to pick music for a wedding ceremony, I do encourage you to take advantage of the in-home meeting, and I suggest that you schedule this no later than 4 - 6 weeks before your big day. When an in-person appointment is not possible, online and phone correspondence can be used to work out all of the necessary details. If, for some reason, you book one of THE QUARTETTE ACCORD ensembles less than 30 days before the event date, I will still make sure that we thoroughly discuss your musical preferences. What are my options if I am interested in having you perform a song/selection that is not included on your repertoire lists? Please feel free to inquire about anything that you don't see listed. Acquiring new repertoire is an ongoing process, so there is always the possibility that I have already added the particular song that you want to my collection. 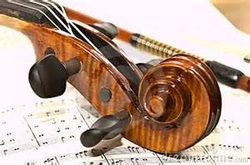 Otherwise, I'll be happy to do some research to determine whether a string ensemble arrangement is readily available for your chosen song, to determine whether sheet music can be purchased from which an arrangement can be prepared, and to determine the additional cost for you. If the additional expense will not fit into your budget, I will also do my best to give you some other options to provide you with a pleasing musical package. If you are considering us for your wedding ceremony, you should first check with your church/synagogue for possible restrictions on bringing in outside musicians, determine whether a cantor/organist is required at a mass, and obtain the name/phone number of the site wedding coordinator, if there is one. You should also give some thought as to whether you plan to have a singer or other instrumentalist participate in the ceremony, as this will affect our overall involvement. Finally, clarify musical taboos, if possible - many churches prohibit "Bridal Chorus" for the bride's entrance, and others won't allow secular love songs during the ceremony. We do ask that you have armless chairs ready for us, as well as access to electrical outlets in the event that we need to use plug-in music stand lights. For reception settings with more than 125 guests, you should check into the possibility of a sound system via either your DJ or the facility coordinator to help amplify our sound. NO! We obtain information needed to keep things running smoothly as part of the in-person consultation. If a one-on-one meeting is not possible (typically for an out-of-town client), a phone appointment or online correspondence can be used to work out all of the details. On the actual wedding day, we will arrive early enough (20 - 30 minutes before we are scheduled to begin pre-ceremony music) to review any last minutes changes, etc. with your coordinator or clergy.